Gingerbread and other spiced foods are a part of Christmas tradition. These macarons have a chocolate ganache filling where the traditional Christmas spices have been added. If enjoying some of these doesn’t give you the Christmas feeling, then I don’t know. Follow the base recipe making the macarons. Add some concentrated red food coloring to the mixture, while beating the egg whites. Bake and cool the macarons. If you want to decorate the macarons like in the picture, make syrup by heating 1 tablespoon water and 1 tablespoon sugar. 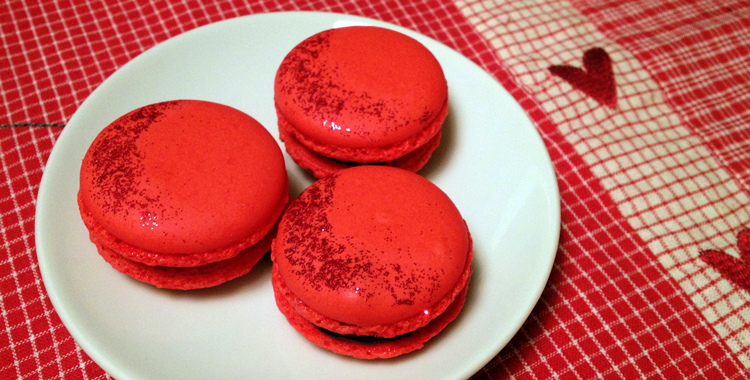 Dip a small paintbrush into the syrup after it is cooled, then in the glitter and paint on the macarons as desired. Combine chocolate and cream in a small pan. Heat the mixture on low heat until the chocolate has melted. Remove the pan from the heat and add the butter and spices. Mix together and leave to cool.